Material:Chiffon with lace applique. 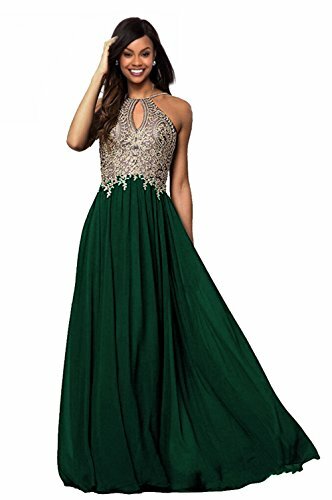 Embroidered halter prom dresses 2018 long evening formal party ball gowns. Please note the order is only fulfilled by "Lily Wedding", if your order is shipped by other sellers, it is fakes, you can report to Amazon. Gold lace applique/ Halter/ Sleeveless/ Floor length/ Zipper closure. Suit for prom/evening/party/ball/bridesmaid and other special occasions. To fit on you well, please refer to OUR OWN SIZE CHART and Measuring Guide on the left and choose the right size for yourself. If you have any doubts about your size or color, please contact us freely. Custom: if you need this service, please tell YOUR WEAR DATE and your correct measurements about BUST-WAIST-HIPS, HEIGHT, HOLLOW TO FLOOR, SHOES HEEL HEIGHT. Handle time 3-5 days,standard shipping 6-8 days,expeited shipping 2-3 business days. If you need it urgently, please help to order with Expeited shipping and tell your WEAR DATE, we will provide rush service. Please note the order is only fulfilled by "Lily Wedding" and amazon prime, if your order is shipped by other sellers, it is fakes, not to lose your money, you can report to Amazon. Embroidery/ V back/ Halter/ Floor length/ Zipper closure. -If you are unsatisfied, please exchange or return it within 14 days after delivery,and products should be the original condtion even after tried on for fit and size. -Buyer pay the return or exchange postage if ordered wrong size/color/style. -Tailoring usually takes 4-7 days, by expeited shipping, it usually takes 2-3 days;by standard shipping,it usually takes 6-8 business days.